“Here’s one from 1967,” said Eric Clapton at the Coliseum last Saturday (July 26). “I hope you recognize it.” Then he launched into “White Room”, a hit from his days with Jack Bruce and Ginger Baker in the power trio Cream. And obviously a good number of the 8,000 or so fans did recognize it. The song, which first appeared on Cream’s ’68 LP Wheels of Fire, drew heavy applause, and even had some dancing in the aisles. But it was only one of many high points in a concert that was full of golden oldies and brand new tunes. After an opening set by Graham Parker & the Shot, there was a short intermission (so short I barely had time to grab a hot dog–which was nice for a change), and songs by the Blues Brothers were run through the P.A. Then Eric took the stage and headed straight into “Tulsa Time”, a rollicking country-rocker from his Slowhand period. “An old reggae song,” followed, Clapton’s version of Bob Marley’s “I Shot the Sheriff”. A couple of tunes from his new album Behind the Sun came next, “Same Old Blues” and “Tangled in Love”. After the surprise of “White Room”, Clapton lit up a smoke and handed the stage over to one of his backup vocalists, Shaun Murphy, who sang a traipsey 12-bar blues called “While You Were Steppin’ Out (Somebody Was Steppin’ In”). Back in the spotlight, Eric drew appreciative hollers for his tender love ballad “Wonderful Tonight”, then played “She’s Waiting”, the opening track of his new LP. Clapton’s other support vocalist, Marcy Levy, then slowed things down with a stirring version of the Beatles’ “She Loves You”. Levy, a longtime collaborator with Clapton (she cowrote his hit “Lay Down Sally”) showed remarkable vocal dexterity on the tune, and was accompanied by the subtle keyboardings of another Clapton vet, Chris Stainton. Another Beatles connection–and another surprise–was thrown in when Clapton played “Badge”, a song he wrote with George Harrison for Cream’s Goodbye record of 1969. Second guitarist Tim Renwick was allowed to take one of his few solos of the night, and then “Badge” sequed into another classic Clapton tune, “Let It Rain”. A lengthy version of Jimmy Reed’s “Tin Pan Alley” followed, and then it was time for J.J. Cale’s “Cocaine”, which was a massive hit for Clapton when he covered it on Slowhand. The crowd sang along whenever the word “cocaine” came up, and Eric injected the song with one of his patented wah-wah solos. 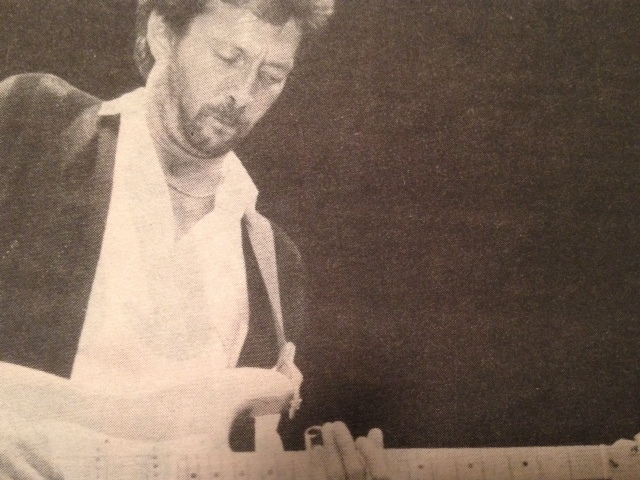 For what was probably the most popular song of the night, Clapton took us back to 1972 for Derek & the Dominos’ “Layla”. Arguably one of the best rock songs ever written, it was followed by an encore of his latest hit, “Forever Man”, and with that the crowed surged to the front of the stage–the burly bouncers retreated behind its wooden barricade. Singers Levy and Murphy returned to the stage clad in the scantiest of black petticoats, causing bassist Donald “Duck” Dunn to proclaim “GODDAMN!”, and while three crew members circled the stage in F-Troop uniforms, Clapton–between mile-wide grins–managed “Further On Up the Road”. It was the last date of his 1985 North American tour, and a time for celebration. It was also his first local appearance in four years, and that was reason enough for his Vancouver fans to join in.